You may have some questions you still want answering before getting in touch. I don't blame you… this is big stuff and want all the details before talking to someone. What does it mean the garage is designed SITE-SPECIFIC? Who are the Cheap Sheds Garages Suitable for? Can the Cheap Sheds Garage range be customised? What are the benefits from buying a Cheap Sheds Garage? Where and How are the garages made (type of steel, fixings)? Can you assemble it yourself/with help or do you need to hire professionals? How will my Cheap Sheds Garage be delivered? What is the guarantee on Cheap Sheds Garages? How do I get Council approval and will you assist? #1 What does it mean the garage is designed SITE-SPECIFIC? Adding a shed, workshop or any steel building to your property is a huge investment, so you don't want to see it damaged. In Australia, we have some extreme weather conditions in different parts of the country. We see bitterly cold temps, extreme heat waves as well as storms and cyclones. We also all live in different terrains from large properties in the plains, or forests to the suburban backyards. So you can imagine that adding a large building may need careful planning. So what our engineers will do is take into account the level of your surface, how exposed the shed is to wind and other elements. They can do all this without even visiting your site thanks to technology! They will engineer and design your building to meet structural requirements for your site. This also means it is more like to be accepted by the council because of its ‘location specific’. #2 Who are the Cheap Sheds Garages suitable for? Cheap Sheds garages are suitable for Residential purposes and a great addition to your home. Whether you are a tradie, family, 4WD or outdoor enthusiast wanting to add a new garage to your new build or property our garages are suitable for you. These garages are available to be ordered and delivered to the following states NSW, ACT, VIC & Non-Cyclonic QLD. We do apologise to our SA, WA and TAS customers that these are currently unavailable to you due to the weight and size of the freight not being supported by transport. If you are in the market, you will be happy to know that they are made of high quality Australian standard steel rated for Region A & B areas in Australia. These garages are NOT cyclone rated and to ensure your safety and the structural warranty of the building the garages you should not add one to your property if you are outside Region A and B. We recommend you check your local council what your area is listed under to avoid the hassle and costs if the decline your paperwork. #3 Can the Cheap Sheds Garages be customised? The Cheap Sheds Garages are pre-designed steel building kits which require site-specific engineering to meet your locations needs. However, some of the features are customisable to make sure you get the best garage for your budget. #4 What are the benefits from buying a Cheap Sheds Garage? Competitive prices and no BS added costs. We can guarantee a great price because we are online retail experts. We are based online so we don't add extra overhead costs to your quote. You can speak directly to a Garage Expert consultant if you need assistance with your order. Your Cheap Sheds Garage will be designed and manufactured right here in Australia by engineers and manufacturer who have 25 years of experiences. Our Garages come with15-Year structural guarantee so you can be confident you are getting quality. #5 Where and how are the garages made (type of steel, fixings)? Right here in Australia! 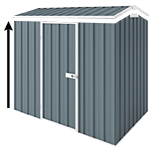 We have always supported Australian Steel Buildings and with our new Cheap Sheds Range that has not changed that. Our suppliers prefabricate all the building structures in the factory based in Queensland. So whether you’re after a garage, workshop, lifestyle building, farm shed, studio or whatever you have in mind, you can be confident you are getting an Aussie Made product. #6 How and when will my Cheap Sheds Garage be delivered? Option 1 ( Recommended). Once you know what product you want, you can request the engineering papers from our team before placing the garage order. There is a $500.00 non-refundable deposit for the engineering which can be taken off your order amount when ordering. Option 2 - if you have already organised pre-approval from your council or not concern about getting your garage approved, you can place your order ahead of time to kick start the manufacturing process. Please note that once you have ordered after 24hrs the $500 Engineering fee for the papers will be non-refundable. Stage 2 is the manufacturing process... Once payment is made and your engineer papers have been provided your order will go to the factory. Once manufacturing of a garage has commenced it cannot be cancelled or returned. So it's important to get your building council approved to avoid any loss of money. The local Authority applications and approvals are your responsibility because each council has different regulations. The final stage is dispatching your garage for transport. From manufacturing to delivery it can take up to 3 weeks from order date. #7 Can you assemble it yourself or do you need to hire professionals? Generally, a garage is a large building which will mean you need a team to put it together. You can choose to build the garage yourself, however, there are some things to be aware of. First and foremost you will be required to own a building licence. For some people, this is no problem but for many, this isn't a great option. If you own a licence or want to apply for one online, you can then legally supervise your own team to assemble the shed or building. So for those farmers with workhands, tradies or builders etc you may have what it requires already, so this option may be the best one for you. Hiring a professional building team is the hassle free option. You can leave it up to the experts who will know exactly what you need and how to do it. By choosing this option, you can also rest assured your investment is in safe hands. Sometimes when you DIY, things can go wrong and can end up costing a lot more than you would expect. What's more, we can provide you with a specialised team to do the job. They will be able to assess your design, property and quote you directly for the job. #8 What is the guarantee on Cheap Sheds Garages? Much like all the other large steel buildings in our range the garages are too backed by a 15-year structural warranty. We understand large buildings are big investments which is why we like to provide you with some security. We stand by our products and services and if you follow our instructions, have it assembled professionally and keep it maintained, I doubt your building will have any failures in the next 15 years or more! Please note that this is a structural warranty. Damage from machinery, cars and extreme weather won't be covered in the 15-year warranty. You can discuss this in more details with one of our team engineers or send us your questions so we can seek advice from you. #9 What are your payment options? Zip Money which is a payment service where you can buy your product, have it delivered and pay later! Best of all it’s Interest-FREE for up to 6 months! You can apply for the loan online up to $5000 in a few minutes and organise low monthly repayments which work best for you. Lay-Buy is an affordable payment plan option which allows you to pay-off your garage via one down payment, with the balance paid over 1, 2 or 3 monthly instalments. It is ideal if you want to pay off a product but secures the product price. Your item is delivered to you after the final payment. A small 0.9% admin fee is payable. #10 How do I get council approval and will you assist? Council Approval is crucial for building sheds of any kind. The bigger they are the more vital it is you take careful steps to meet the council regulations. Each council has different requirements and a different process so it’s best to check with them directly for what needs to be done. We provide you with all the paperwork you will need for your product to submit. Council approval can take anywhere from 2 weeks to 2 months depending on your area and how they operate.